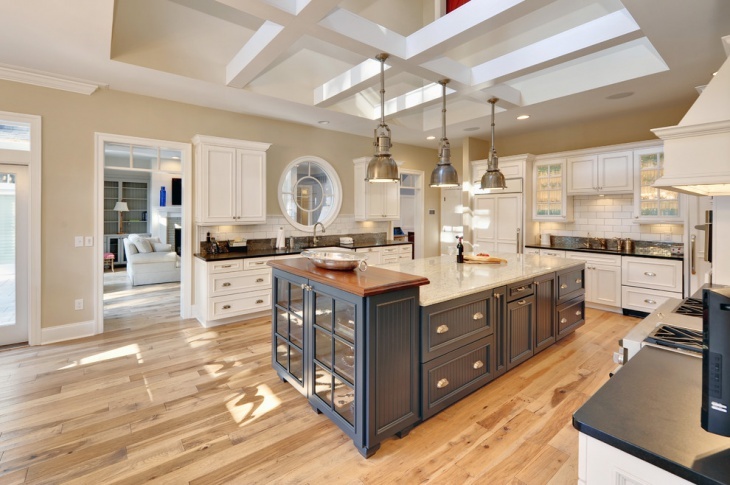 The standard way of styling your kitchen would be to stick to a neutral look. But you can extend this classic and a conventional appearance by adding a touch of color. 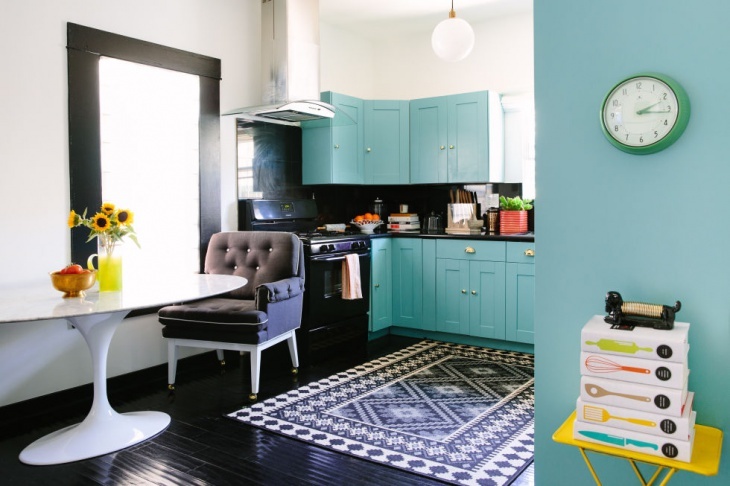 Color can be one way to bring a sassy finish to your culinary space. 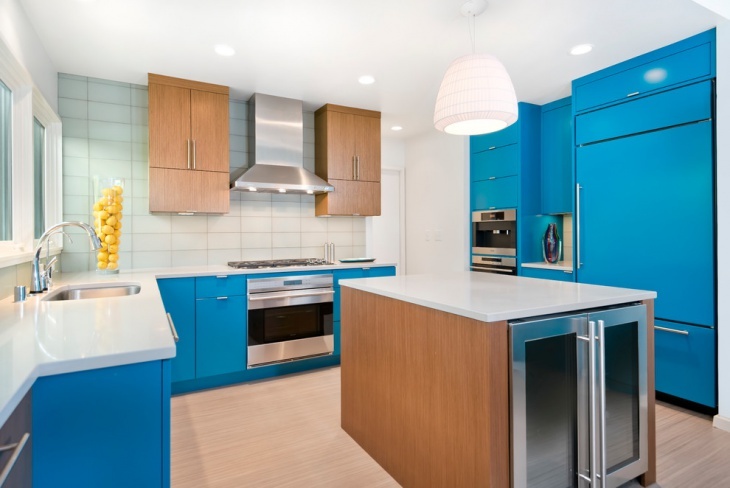 If you are looking to custom the look without having to change and remodel the entire kitchen, adding blue color cabinets can be the soft and comfortable option to opt for. Blue being a cool toned color will help you transform the whole look without being too harsh on the eye. 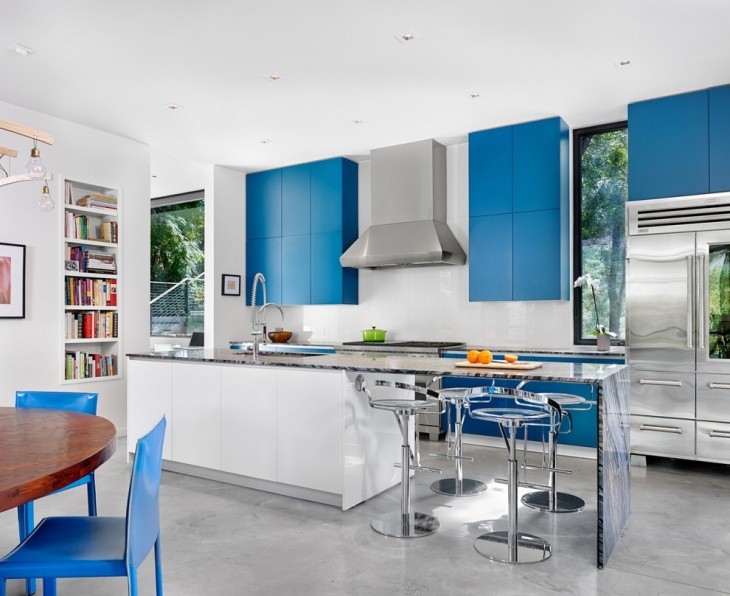 We are enlisting 20 blue kitchen cabinet designs to inspire you for bringing in the missing warmth and color to your space. 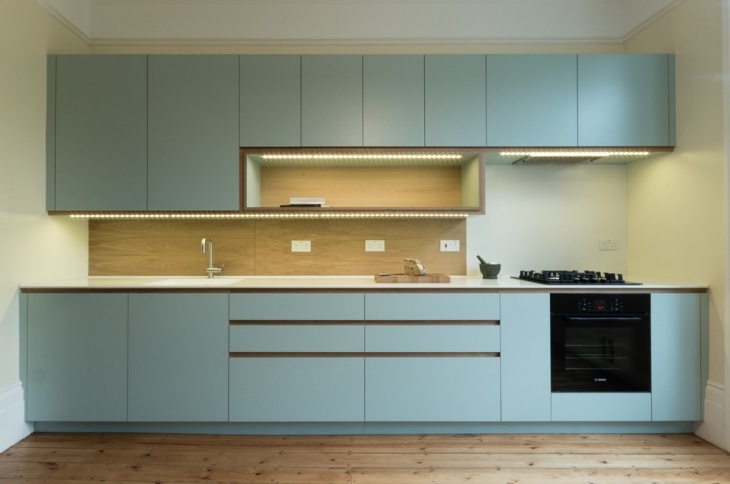 If you wish to give that extra edge, adding teal blue to all the cabinets is the way to go. You can compliment all the other elements in correspondence to the color. If you feel the look might be too overbearing then start by coloring one small section and proceed accordingly. 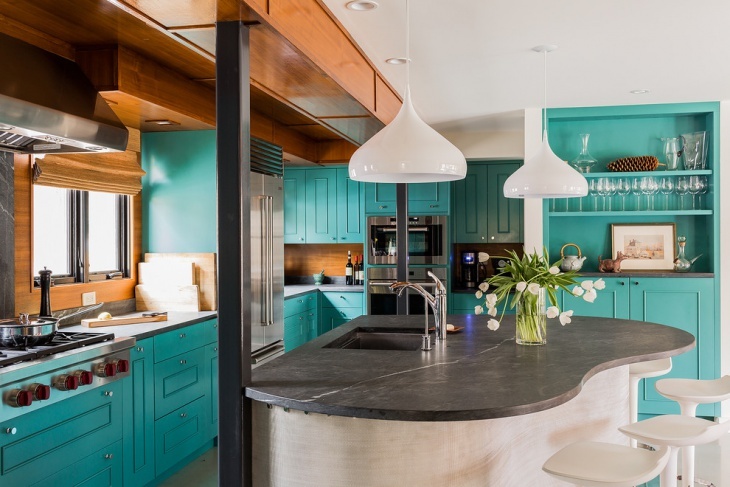 You can even match a light blue stone countertop for giving the finishing touch to your kitchen. Blue can be complemented beautifully with white. If you have a clear white shelve, basin and window frames, go for a matte navy blue. The look will instantly bring a sleek and royal touch to your kitchen. You can even add yellow tile in the small section of the front wall for adding a subtle contrast to your space. 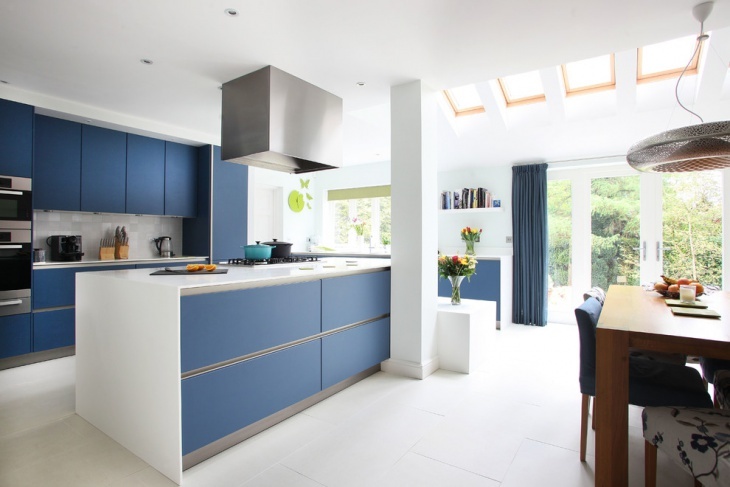 Theme in your kitchen, we would suggest you try your hands with blue. It is subtle and with the various hues available it sure will be able to suit the personal choice of the individual. 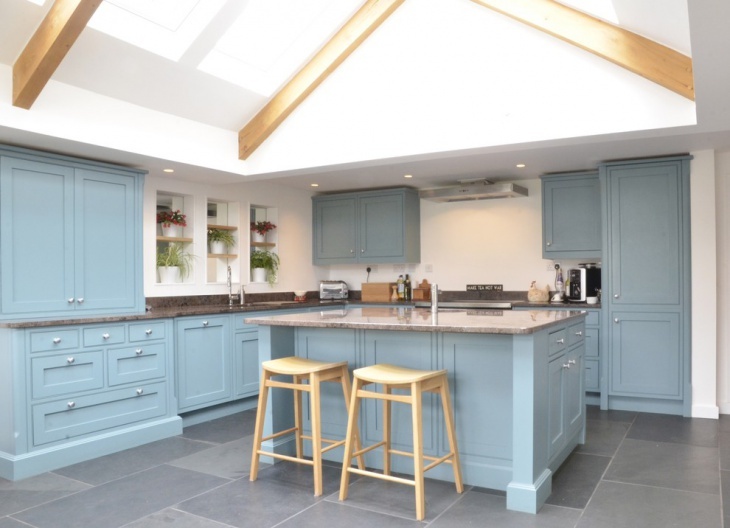 If you have wooden look dominating your kitchen space, transform the rustic to classy by adding simple light blue cabinets. 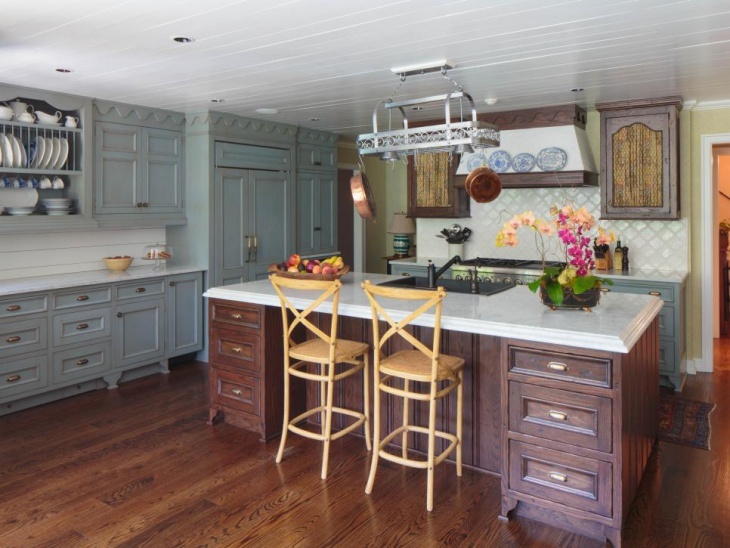 The look effortlessly lifts up the entire appearance of your kitchen. You can even add a colored rug to the floor for accentuating the contrast. 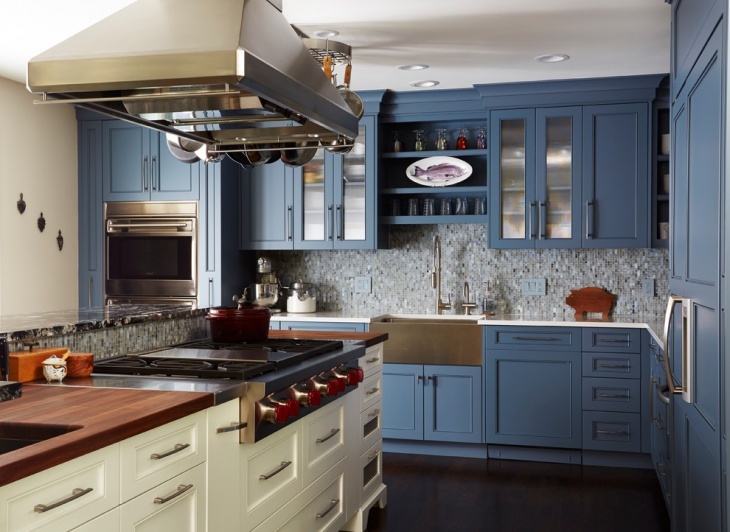 If you receive abundant natural light in your kitchen, adding soft blue themed look is the best color to choose for your cooking space. 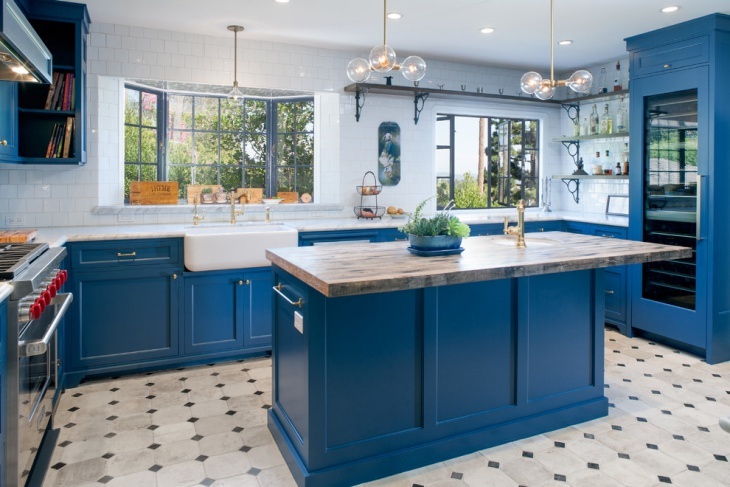 Adding a white counter top with blue cabinets is another way to bring in the color and variation to Contrast the look with wooden stools and white shelves and the transformation is done. your kitchen. 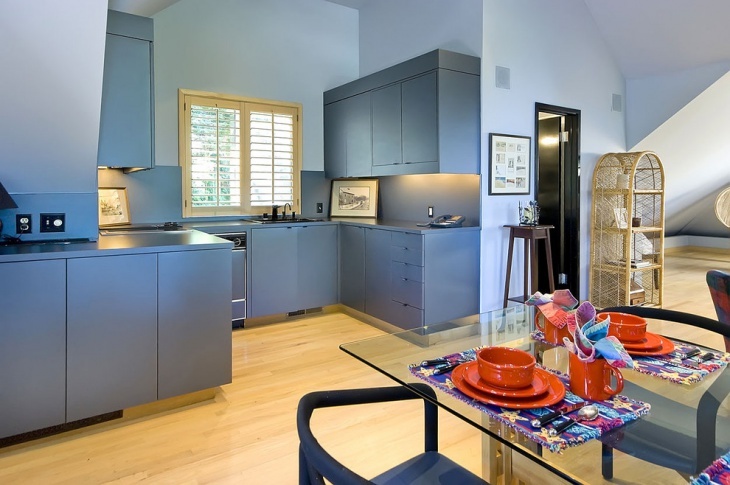 You can even add a blue mat to your wooden flooring for matching the look further with your cabinets. Matte royal blue is another edgy color to experiment with. The color is strong and would require you to keep all the remaining elements subtle and plain. 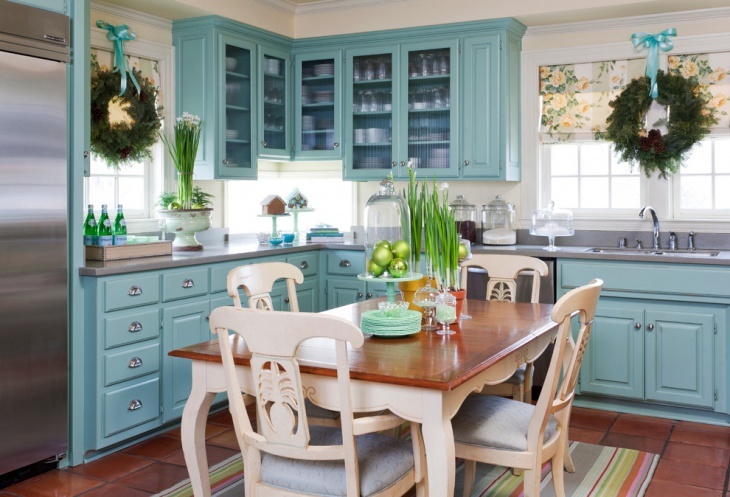 If you have a bold colorful theme in your home, adding a similar touch to your kitchen can be an excellent fit. 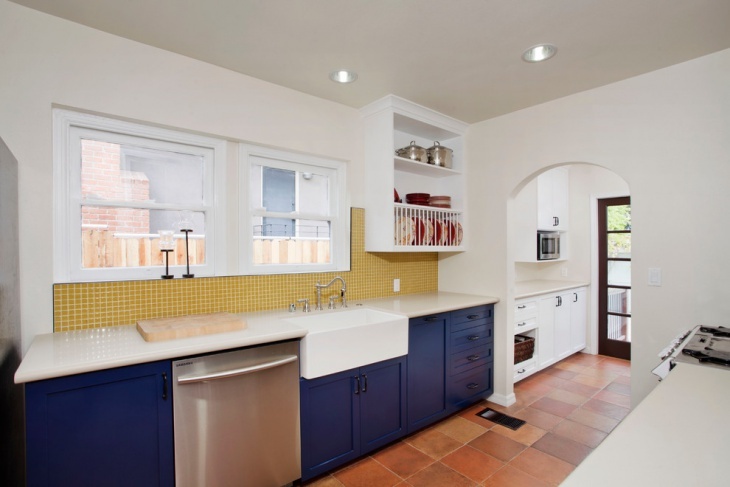 Contrast the look of the blue with white cabinets for an appearance that is sober as well as stylish. 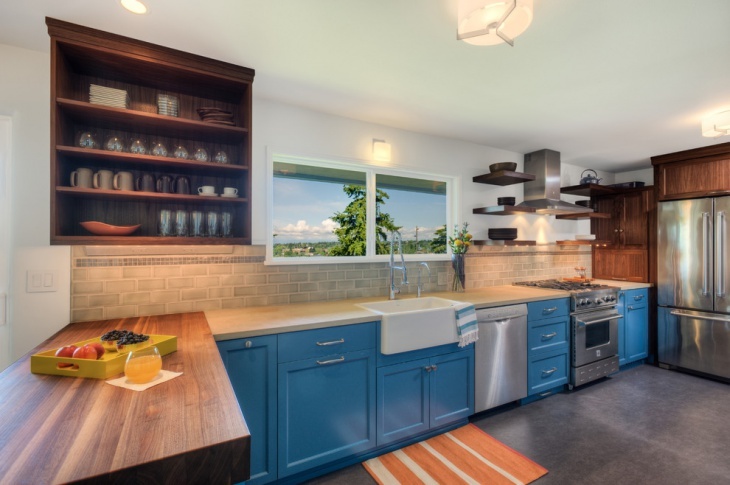 You can add a wooden counter top to the white cabinets and a white to your blue ones for a crafty and smart mix of colors. 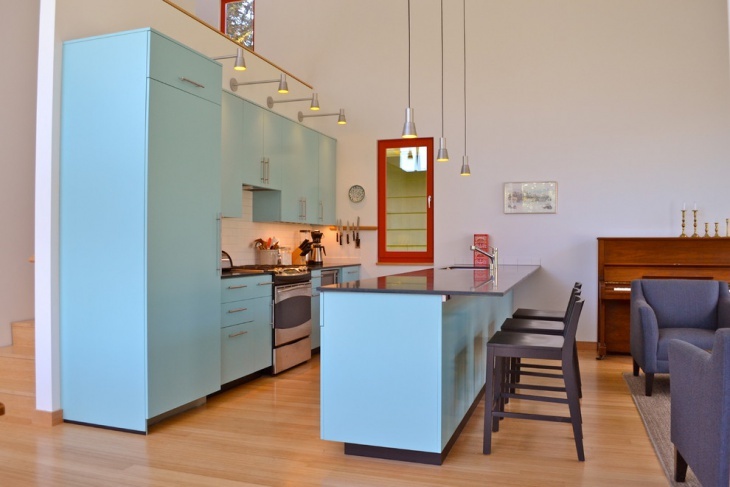 If you have included the blue in your kitchen and still feel it misses something, try and include red either with artwork or decorating pieces or just by coloring the frame of your window red. The look helps to add a complimenting contrast to the standard tone. 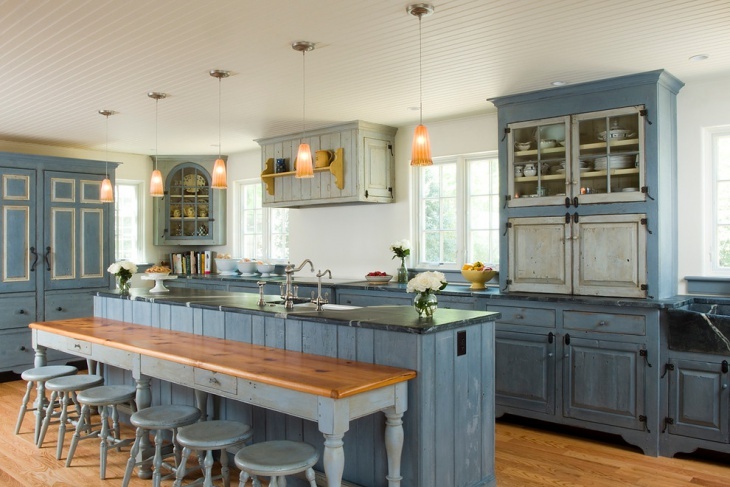 Match the look of blue cabinets with wooden fittings and white lamps. The look is elegant and would reflect a class with minimalism. 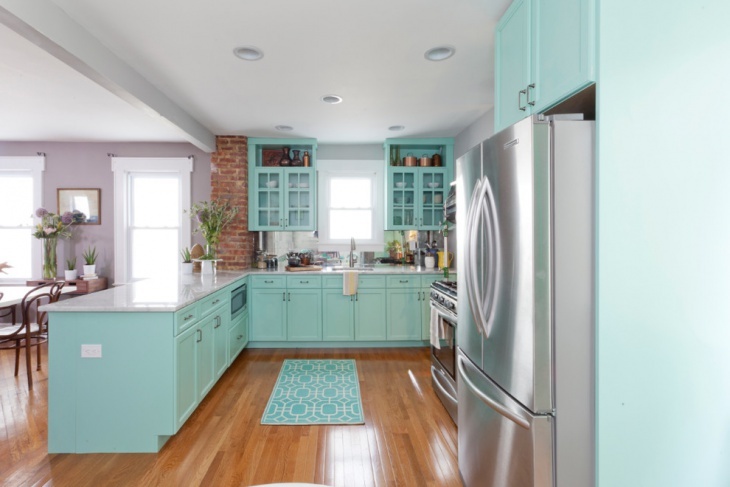 If you are looking for a vintage transformation, adding blue cabinets along with flowery drapes can be the best way to bring a warm appearance to your kitchen. 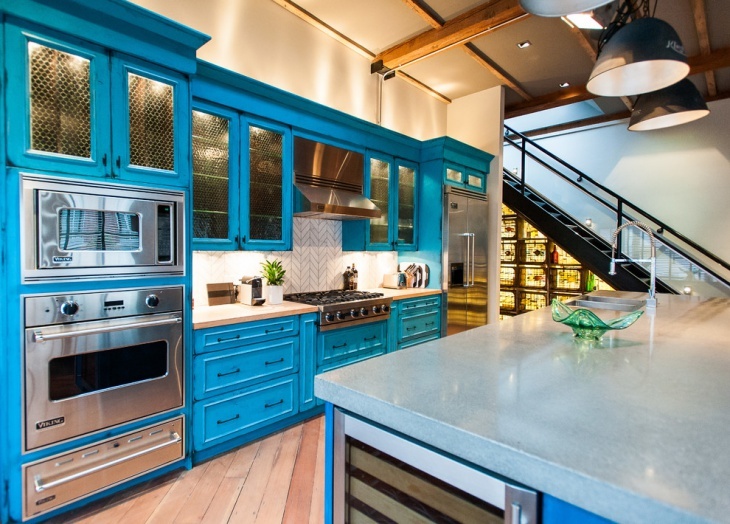 If you are hesitant to experiment with a colored theme in your kitchen, we would suggest you try your hands with blue. It is subtle and with the various hues available it sure will be able to suit the personal choice of the individual.